Make these Adorable Handprint Spiders! Show your kids that spiders don't have to be spooky! 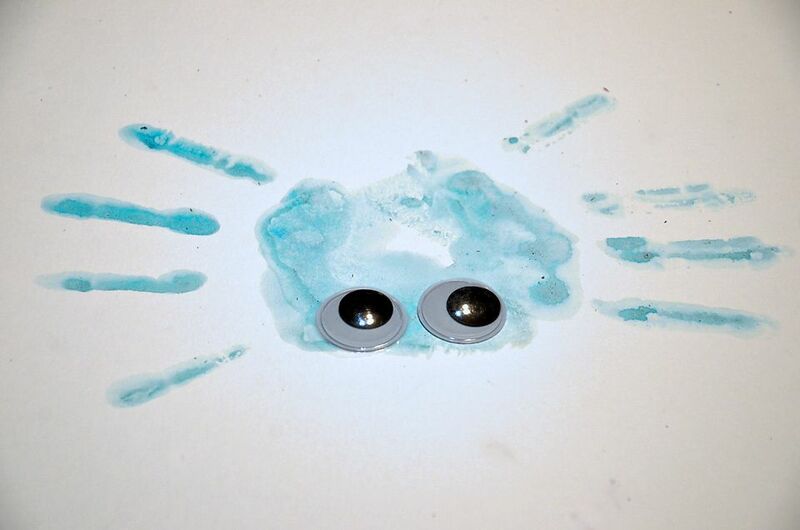 Make some fun googly eyed handprint spiders! This is a great project for kids that like to get messy! Toddlers will love this project! You could use acrylics, finger paints or watercolors. We chose watercolors for this project. The clean up is easy and everything washed right off their hands. We also used watercolor paper for this project. Explain to the children that are doing this project how spiders only have 8 legs. So, while painting their hands, they'll need to skip the thumb and paint their fingers only. Once they have covered the hand in paint (skipping the thumb), press down firmly on your paper. This will be one side of the spider and 4 of the legs. Now, paint the opposite hand, skipping the thumb. Press this hand down on top of the other handprint. Be sure to match up the palms and have the fingers off to the opposite side. Allow your handprint spider body to dry. Once it is dry, you can add some embellishments. How about adding some eyes to your spider? You can draw them on, paint them on or use googly eyes like we did and glue them on. You can also add detail to the body with paints or markers. He isn't so scary now is he? During this project would be a great time to talk about spiders and what they do for the environment. Help your child research what kinds of spiders can be found in your area. Which are poisonous to humans?